James Ephraim Lovelock, CH CBE FRS (born 26 July 1919) is an independent scientist, environmentalist, and futurist who lives in Dorset, England. He is best known for proposing the Gaia hypothesis, which postulates that the Earth functions as a self-regulating system. With a PhD in medicine, he performed cryopreservation experiments on rodents, including successfully thawing frozen specimens. His methods were influential in the theories of cryonics (the cryopreservation of humans). He invented the electron capture detector, and using it, became the first to detect the widespread presence of CFCs in the atmosphere. While designing scientific instruments for NASA, he developed the Gaia hypothesis. In the 2000s, he proposed a method of climate engineering to restore carbon dioxide-consuming algae. He has been an outspoken member of Environmentalists for Nuclear, citing the effects of carbon dioxide as being more harmful to the environment, and warning of global warming due to the greenhouse effect. He has written several environmental science books based upon the Gaia hypothesis since the late 1970s. James Lovelock was born in Letchworth Garden City in Hertfordshire, England, to working class parents who were strong believers in education. Nell, his mother, started work at 13 in a pickle factory. His father, Tom, had served six months hard labour for poaching in his teens and was illiterate until attending technical college. The family moved to London, where Lovelock's dislike of authority made him, by his own account, an unhappy pupil at Strand School. Lovelock could not afford to go to university, something which he believes helped prevent him becoming overspecialised and aided the development of Gaia theory. He worked at a photography firm, attending Birkbeck College during the evenings, before being accepted to study chemistry at the University of Manchester, where he was a student of the Nobel Prize laureate Professor Alexander Todd. Lovelock worked at a Quaker farm before a recommendation from his professor led to him taking up a Medical Research Council post, working on ways of shielding soldiers from burns. Lovelock refused to use the shaved and anaesthetised rabbits that were used as burn victims, and exposed his own skin to heat radiation instead, an experience he describes as "exquisitely painful". His student status enabled temporary deferment of military service during the Second World War, but he registered as a conscientious objector. He later abandoned his conscientious objection in the light of Nazi atrocities, and tried to enlist in the armed forces, but was told that his medical research was too valuable for the enlistment to be approved. In 1948, Lovelock received a PhD degree in medicine at the London School of Hygiene and Tropical Medicine. He spent the next two decades working at London's National Institute for Medical Research. In the United States, he has conducted research at Yale, Baylor College of Medicine, and Harvard University. In the mid-1950s, Lovelock experimented with the cryopreservation of rodents, determining that hamsters could be frozen with 60% of the water in the brain crystallized into ice with no adverse effects recorded. Other organs were shown to be susceptible to damage. The results were influential in the theories of cryonics. A lifelong inventor, Lovelock has created and developed many scientific instruments, some of which were designed for NASA in its planetary exploration program. It was while working as a consultant for NASA that Lovelock developed the Gaia hypothesis, for which he is most widely known. In early 1961, Lovelock was engaged by NASA to develop sensitive instruments for the analysis of extraterrestrial atmospheres and planetary surfaces. The Viking program, which visited Mars in the late 1970s, was motivated in part to determine whether Mars supported life, and many of the sensors and experiments that were ultimately deployed aimed to resolve this issue. During work on a precursor of this program, Lovelock became interested in the composition of the Martian atmosphere, reasoning that many life forms on Mars would be obliged to make use of it (and, thus, alter it). However, the atmosphere was found to be in a stable condition close to its chemical equilibrium, with very little oxygen, methane, or hydrogen, but with an overwhelming abundance of carbon dioxide. To Lovelock, the stark contrast between the Martian atmosphere and chemically dynamic mixture of the Earth's biosphere was strongly indicative of the absence of life on Mars. However, when they were finally launched to Mars, the Viking probes still searched (unsuccessfully) for extant life there. Further experiments to search for life on Mars have been carried out by further space probes, most recently NASA'S 2012 Curiosity Rover. Lovelock had invented the electron capture detector, which ultimately assisted in discoveries about the persistence of CFCs and their role in stratospheric ozone depletion. After studying the operation of the Earth's sulphur cycle, Lovelock and his colleagues, Robert Jay Charlson, Meinrat Andreae and Stephen G. Warren developed the CLAW hypothesis as a possible example of biological control of the Earth's climate. Lovelock was elected a Fellow of the Royal Society in 1974. He served as the president of the Marine Biological Association (MBA) from 1986 to 1990, and has been an Honorary Visiting Fellow of Green Templeton College, Oxford (formerly Green College, Oxford) since 1994. As an independent scientist, inventor, and author, Lovelock worked out of a barn-turned-laboratory he called his "experimental station" located in a wooded valley on the Devon/Cornwall border in the South West England. On 8 May 2012, he appeared on the Radio Four series The Life Scientific, talking to Jim al-Khalili about the Gaia hypothesis. On the programme, he mentioned how his ideas had been received by various people, including Jonathan Porritt. He also mentioned how he had a claim for inventing the microwave oven. He later explained this claim in an interview with The Manchester Magazine. Lovelock said that he did create an instrument during his time studying causes of damage to living cells and tissue, which had, according to him, "almost everything you would expect in an ordinary microwave oven". He invented the instrument for the purpose of heating up frozen hamsters in a way that caused less suffering to the animals, as opposed to the traditional way which involved putting red hot spoons on the animals' chest to heat them up. He believes that at the time, nobody had gone that far and made an embodiment of an actual microwave oven. However, he does not claim to have been the first person to have the idea of using microwaves for cooking. However, the experiment did provide the first useful data on the ubiquitous presence of CFCs in the atmosphere. The damage caused to the ozone layer by the photolysis of CFCs was later discovered by Sherwood Rowland and Mario Molina. After hearing a lecture on the subject of Lovelock's results, Sherwood and Molina embarked on research that resulted in the first published paper that suggested a link between stratospheric CFCs and ozone depletion in 1974 (for which they later shared the 1995 Nobel Prize in Chemistry with Paul Crutzen). While the hypothesis was readily accepted by many in the environmentalist community, it has not been widely accepted within the scientific community as a whole. Among its most prominent critics are the evolutionary biologists Richard Dawkins, Ford Doolittle, and Stephen Jay Gould, a convergence of opinion among a trio whose views on other scientific matters often diverge. These (and other) critics have questioned how natural selection operating on individual organisms can lead to the evolution of planetary-scale homeostasis. In response to this Lovelock, together with Andrew Watson, published the computer model Daisyworld in 1983, that postulated a hypothetical planet orbiting a star whose radiant energy is slowly increasing or decreasing. In the non-biological case, the temperature of this planet simply tracks the energy received from the star. However, in the biological case, ecological competition between "daisy" species with different albedo values produces a homeostatic effect on global temperature. When energy received from the star is low, black daisies proliferate since they absorb a greater fraction of the heat, but when energy input is high, white daisies predominate since they reflect excess heat. As the white and black daisies have contrary effects on the planet's overall albedo and temperature, changes in their relative populations stabilise the planet's climate and to keep temperature within an optimal range despite fluctuations in energy from the star. Lovelock argued that Daisyworld, although a parable, illustrates how conventional natural selection operating on individual organisms can still produce planetary-scale homeostasis. I have never regarded nuclear radiation or nuclear power as anything other than a normal and inevitable part of the environment. Our prokaryotic forebears evolved on a planet-sized lump of fallout from a star-sized nuclear explosion, a supernova that synthesised the elements that go to make our planet and ourselves. A television interviewer once asked me, "But what about nuclear waste? Will it not poison the whole biosphere and persist for millions of years?" I knew this to be a nightmare fantasy wholly without substance in the real world... One of the striking things about places heavily contaminated by radioactive nuclides is the richness of their wildlife. This is true of the land around Chernobyl, the bomb test sites of the Pacific, and areas near the United States' Savannah River nuclear weapons plant of the Second World War. Wild plants and animals do not perceive radiation as dangerous, and any slight reduction it may cause in their lifespans is far less a hazard than is the presence of people and their pets... I find it sad, but all too human, that there are vast bureaucracies concerned about nuclear waste, huge organisations devoted to decommissioning power stations, but nothing comparable to deal with that truly malign waste, carbon dioxide. Writing in the British newspaper The Independent in January 2006, Lovelock argued that, as a result of global warming, "billions of us will die and the few breeding pairs of people that survive will be in the Arctic where the climate remains tolerable" by the end of the 21st century. He has been quoted in The Guardian that 80% of humans will perish by 2100 AD, and this climate change will last 100,000 years. According to James Lovelock, by 2040, the world population of more than six billion will have been culled by floods, drought and famine. Indeed, "[t]he people of Southern Europe, as well as South-East Asia, will be fighting their way into countries such as Canada, Australia and Britain." By 2040, parts of the Sahara desert will have moved into middle Europe. We are talking about Paris – as far north as Berlin. In Britain we will escape because of our oceanic position. If you take the Intergovernmental Panel on Climate Change predictions, then by 2040 every summer in Europe will be as hot as it was in 2003 – between 110F and 120F. It is not the death of people that is the main problem, it is the fact that the plants can't grow – there will be almost no food grown in Europe. We are about to take an evolutionary step and my hope is that the species will emerge stronger. It would be hubris to think humans as they now are [are] God's chosen race. He further predicted, the average temperature in temperate regions would increase by as much as 8 °C and by up to 5 °C in the tropics, leaving much of the world's land uninhabitable and unsuitable for farming, with northerly migrations and new cities created in the Arctic. He predicted much of Europe will have become uninhabitable having turned to desert and Britain will have become Europe's "life-raft" due to its stable temperature caused by being surrounded by the ocean. He suggested that "we have to keep in mind the awesome pace of change and realise how little time is left to act, and then each community and nation must find the best use of the resources they have to sustain civilisation for as long as they can." He partly retreated from this position in a September 2007 address to the World Nuclear Association's Annual Symposium, suggesting that climate change would stabilise and prove survivable, and that the Earth itself is in "no danger" because it would stabilise in a new state. Life, however, might be forced to migrate en masse to remain in habitable climes. In 2009, he became a patron of Population Matters (formerly known as the Optimum Population Trust), which campaigns for a gradual decline in the global human population to a sustainable level. Statements from 2012 portray Lovelock as continuing his concern over global warming while at the same time criticizing extremism and suggesting alternatives to oil, coal and the green solutions he does not support. One thing that being a scientist has taught me is that you can never be certain about anything. You never know the truth. You can only approach it and hope to get a bit nearer to it each time. You iterate towards the truth. You don’t know it. He criticizes environmentalists for treating global warming like a religion. It just so happens that the green religion is now taking over from the Christian religion. I don't think people have noticed that, but it's got all the sort of terms that religions use ... The greens use guilt. That just shows how religious greens are. You can’t win people round by saying they are guilty for putting (carbon dioxide) in the air. The problem is we don't know what the climate is doing. We thought we knew 20 years ago. That led to some alarmist books – mine included – because it looked clear-cut, but it hasn't happened. The climate is doing its usual tricks. There’s nothing much really happening yet. We were supposed to be halfway toward a frying world now. The world has not warmed up very much since the millennium. Twelve years is a reasonable time ... it (the temperature) has stayed almost constant, whereas it should have been rising — carbon dioxide is rising, no question about that. In a follow up interview Lovelock stated his support for natural gas; he now favors fracking as a low-polluting alternative to coal. He opposes the concept of "sustainable development", where modern economies might be powered by wind turbines, calling it meaningless drivel. He keeps a poster of a wind turbine to remind himself how much he detests them. In September 2007, Lovelock and Chris Rapley proposed the construction of ocean pumps to pump water up from below the thermocline to "fertilize algae in the surface waters and encourage them to bloom". The basic idea was to accelerate the transfer of carbon dioxide from the atmosphere to the ocean by increasing primary production and enhancing the export of organic carbon (as marine snow) to the deep ocean. A scheme similar to that proposed by Lovelock and Rapley is already being independently developed by a commercial company. The proposal attracted widespread media attention and criticism. Commenting on the proposal, Corinne Le Quéré, a University of East Anglia researcher, said "It doesn’t make sense. There is absolutely no evidence that climate engineering options work or even go in the right direction. I’m astonished that they published this. Before any geoengineering is put to work a massive amount of research is needed – research which will take 20 to 30 years". Other researchers have claimed that "this scheme would bring water with high natural pCO2 levels (associated with the nutrients) back to the surface, potentially causing exhalation of CO2". Lovelock subsequently said that his proposal was intended to stimulate interest and research would be the next step. Sustainable retreat is a concept developed by James Lovelock in order to define the necessary changes to human settlement and dwelling at the global scale with the purpose of adapting to global warming and preventing its expected negative consequences on humans. Retreat, in his view, means it's time to start talking about changing where we live and how we get our food; about making plans for the migration of millions of people from low-lying regions like Bangladesh into Europe; about admitting that New Orleans is a goner and moving the people to cities better positioned for the future. Most of all, he says, it's about everybody "absolutely doing their utmost to sustain civilization, so that it doesn't degenerate into Dark Ages, with warlords running things, which is a real danger. We could lose everything that way. The concept of sustainable retreat emphasized a pattern of resource use that aims to meet human needs with lower levels and/or less environmentally harmful types of resources. He has invented a family of ionisation detectors for gas chromatography. His electron capture detectors are the most sensitive that have been made and are universally used on pollution problems for residual halogen compounds. He has many inventions, including a gas chromatograph, which will be used to investigate planetary atmospheres. His chromatographic work has led to investigation of blood lipids in various animals, including arteriosclerotic humans. He has made a study of detecting life on other planets by analysis of their atmosphere and extended this to world pollution problems. His work generally shows remarkable originality, simplicity and ingenuity. Lovelock has been awarded a number of prestigious prizes including the Tswett Medal (1975), the American Chemical Society Award in Chromatography (1980), the World Meteorological Organization Norbert Gerbier–MUMM Award (1988), the Dr A.H. Heineken Prize for Environmental Sciences (1990) and the Royal Geographical Society Discovery Lifetime award (2001). In 2006 he received the Wollaston Medal, the Geological Society of London's highest award, whose previous recipients include Charles Darwin . Lovelock was appointed a Commander of the Order of the British Empire (CBE) for services to the study of the Science and Atmosphere in the 1990 New Year Honours and a Member of the Order of the Companions of Honour (CH) for services to Global Environment Science in the 2003 New Year Honours. In March 2012, the National Portrait Gallery unveiled a new portrait of Lovelock by British artist Michael Gaskell (2011). The collection also has two photographic portraits by Nick Sinclair (1993) and Paul Tozer (1994). The archive of the Royal Society of Arts has a 2009 image taken by Anne-Katrin Purkiss. Lovelock agreed to sit for sculptor Jon Edgar in Devon during 2007, as part of The Environment Triptych (2008) along with heads of Mary Midgley and Richard Mabey. A bronze head is in the collection of the sitter and the terracotta is in the archive of the artist. Lovelock, James (2014). A Rough Ride to the Future. Allen Lane. ISBN 978-0241004760. Lovelock, James (2009). The Vanishing Face of Gaia: A Final Warning: Enjoy It While You Can. Allen Lane. ISBN 978-1-84614-185-0. Lovelock, James (2006). The Revenge of Gaia: Why the Earth Is Fighting Back – and How We Can Still Save Humanity. Santa Barbara (California): Allen Lane. ISBN 0-7139-9914-4. Lovelock, James; Sidney Epton (6 February 1975). "The Quest for Gaia". New Scientist. 65 (935): 304. Retrieved 10 April 2014. Lovelock, James; Jack Hudson; Marlene Taschen. "James Lovelock et al. The Earth and I". TASCHEN. ISBN 978-3-8365-5111-3. Retrieved 30 June 2017. ^ "Lovelock: Wollaston Medal citation". 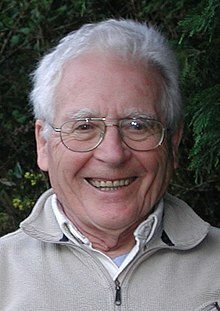 jameslovelock.org. ^ "Arne Naess Chair » About". University of Oslo. Archived from the original on 14 June 2011. Retrieved 8 February 2019. ^ Ball, P. (2014). "James Lovelock reflects on Gaia's legacy". Nature. doi:10.1038/nature.2014.15017. ^ ''Homage to Gaia''. Books.google.co.uk. 2001. ISBN 9780198604297. Retrieved 1 September 2012. ^ a b "From Manchester to Mars". The Manchester Magazine. Archived from the original on 20 August 2016. Retrieved 15 August 2016. ^ a b James Lovelock: The green man, Ian Irvine, The Independent, 3 December 2005. Retrieved 14 May 2008. ^ Homage to Gaia, Oxford, 2000, p80. ^ "The Cryobiological Case for Cryonics" (PDF). Cryonics. Vol. 9(3) no. 92. Alcor Life Extension Foundation. March 1988. p. 27. ^ a b Lovelock, J. E. (1965). "A Physical Basis for Life Detection Experiments". Nature. 207 (4997): 568–70. Bibcode:1965Natur.207..568L. doi:10.1038/207568a0. PMID 5883628. ^ a b Lovelock, J. E. (1971). "Atmospheric Fluorine Compounds as Indicators of Air Movements". Nature. 230 (5293): 379. Bibcode:1971Natur.230..379L. doi:10.1038/230379a0. ^ a b Lovelock, J. E.; Maggs, R. J.; Wade, R. J. (1973). "Halogenated Hydrocarbons in and over the Atlantic". Nature. 241 (5386): 194. Bibcode:1973Natur.241..194L. doi:10.1038/241194a0. ^ Lovelock, J. E.; Maggs, R. J.; Rasmussen, R. A. (1972). "Atmospheric Dimethyl Sulphide and the Natural Sulphur Cycle". Nature. 237 (5356): 452. Bibcode:1972Natur.237..452L. doi:10.1038/237452a0. ^ Charlson, R. J.; Lovelock, J. E.; Andreae, M. O.; Warren, S. G. (1987). "Oceanic phytoplankton, atmospheric sulphur, cloud albedo and climate". Nature. 326 (6114): 655. Bibcode:1987Natur.326..655C. doi:10.1038/326655a0. ^ a b "Library and Archive Catalogue EC/1974/16: Lovelock, James Ephraim". London: The Royal Society. Archived from the original on 9 April 2014. ^ a b c Hickman, Leo (15 June 2012). "James Lovelock: The UK should be going mad for fracking". The Guardian (UK). Retrieved 24 June 2012. ^ Walker, S. J.; Weiss, R. F.; Salameh, P. K. (2000). "Reconstructed histories of the annual mean atmospheric mole fractions for the halocarbons CFC-11 CFC-12, CFC-113, and carbon tetrachloride". Journal of Geophysical Research. 105: 14285. Bibcode:2000JGR...10514285W. doi:10.1029/1999JC900273. ^ F. Sherwood Rowland and Mario J. Molina (7 December 2000). "CFC-Ozone Puzzle: Lecture". Archived from the original on 16 February 2009. Retrieved 10 December 2007. ^ Lovelock, J. (1972). "Gaia as seen through the atmosphere". Atmospheric Environment. 6 (8): 579–580. Bibcode:1972AtmEn...6..579L. doi:10.1016/0004-6981(72)90076-5. ^ Lovelock, J. E.; Margulis, L. (1974). "Atmospheric homeostasis by and for the biosphere: The gaia hypothesis". Tellus. 26: 2. Bibcode:1974Tell...26....2L. doi:10.1111/j.2153-3490.1974.tb01946.x. ^ Dawkins, Richard (1999) . The Extended Phenotype The Long Reach of the Gene. Oxford University Press. ISBN 0-19-288051-9. ^ Watson, A.J. ; J.E. Lovelock (1983). "Biological homeostasis of the global environment: the parable of Daisyworld". Tellus B. International Meteorological Institute. 35 (4): 286–9. Bibcode:1983TellB..35..284W. doi:10.1111/j.1600-0889.1983.tb00031.x. ^ a b c d e Johnston, Ian. "'Gaia' scientist James Lovelock: I was 'alarmist' about climate change". MSNBC. Archived from the original on 24 April 2012. Retrieved 12 November 2016. ^ Russill, C.; Nyssa, Z. (2009). "The tipping point trend in climate change communication". Global Environmental Change. 19 (3): 336. doi:10.1016/j.gloenvcha.2009.04.001. ^ a b The Earth is about to catch a morbid fever that may last as long as 100,000 years Archived 8 April 2006 at the Wayback Machine, James Lovelock, The Independent, 16 January 2006. Retrieved 4 October 2007. ^ a b c d "Daily Mail – 22 March 2008 – We're all doomed ! 40 years from global catastrophe – says climate change expert". Dailymail.co.uk. 22 March 2008. Retrieved 1 September 2012. ^ "Gaia scientist to be OPT patron". Optimum Population Trust. 26 August 2009. Archived from the original on 28 February 2012. Retrieved 27 August 2009. ^ a b c d e f Goldstein, Lorrie (23 June 2012). "Green 'drivel' exposed". Toronto Sun. Retrieved 22 June 2012. ^ "James Lovelock letter on wind turbines Broadbury Ridge" (PDF). The Register. 12 December 2012. Retrieved 12 January 2013. ^ Lovelock, E.; Rapley, G. (September 2007). "Ocean pipes could help the Earth to cure itself". Nature. 449 (7161): 403. Bibcode:2007Natur.449..403L. doi:10.1038/449403a. ISSN 0028-0836. PMID 17898747. 2 Using Atmocean Upwelling Archived 13 October 2007 at the Wayback Machine, Atmocean. Retrieved 3 October 2007. ^ Pipes hung in the sea could help planet to 'heal itself' Archived 11 October 2007 at the Wayback Machine, Michael McCarthy, The Independent, 27 September 2007. Retrieved 4 October 2007. ^ a b Shepherd, J.; Iglesias-Rodriguez, D.; Yool, A. (2007). "Geo-engineering might cause, not cure, problems". Nature. 449 (7164): 781. Bibcode:2007Natur.449..781S. doi:10.1038/449781a. ^ Lovelock, James (2009). The Vanishing Face of Gaia: A Final Warning: Enjoy It While You Can. Allen Lane. ISBN 978-1-84614-185-0. ^ Lovelock, James (2006). The Revenge of Gaia: Why the Earth Is Fighting Back - and How We Can Still Save Humanity. Santa Barbara, California: Allen Lane. ISBN 0-7139-9914-4. ^ Goodell, Jeff (1 November 2007). "James Lovelock, the Prophet". Rolling Stone. ^ "No. 51981". The London Gazette (Supplement). 29 December 1989. p. 8. ^ "No. 56797". The London Gazette (Supplement). 31 December 2002. p. 26. ^ The RSA The RSA+ Add Contact (10 March 2009). 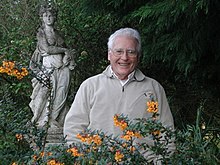 "James Lovelock by Anne Purkiss | Flickr - Photo Sharing!". Flickr. Retrieved 1 September 2012. ^ authors, various (2008). Responses – Carvings and Claywork – Jon Edgar Sculpture 2003-2008. UK: Hesworth Press. ISBN 978-0-9558675-0-7. ^ Edgar, Jon. "portrait of James Lovelock". Archived from the original on 24 July 2012. Retrieved 12 November 2016. Listen to an oral history interview with James Lovelock, recorded for An Oral History of British Science at the British Library. Royal Society of Arts Vision webcast – James Lovelock in conversation with Tim Radford — The Vanishing Face of Gaia, 23 February 2009. This page is based on the Wikipedia article James Lovelock; it is used under the Creative Commons Attribution-ShareAlike 3.0 Unported License (CC-BY-SA). You may redistribute it, verbatim or modified, providing that you comply with the terms of the CC-BY-SA.